At least 27 children in a village in southeastern Nigeria have died from gastroenteritis after drinking contaminated water from a communal pool, the local health commissioner said Wednesday. An emergency medical team had been sent to the village of Ndiaegu-Amaegu in Ebonyi state but residents reported the outbreak too late for doctors to prevent more cases, state health commissioner Sunday Nwangele told Reuters. "People of the community draw water from the same source, a kind of pool, where animals also drink from," he said. "They put the water to domestic use and bath with it too, so we think that is how they got it. It must have entered their mouth somehow and it began to spread." 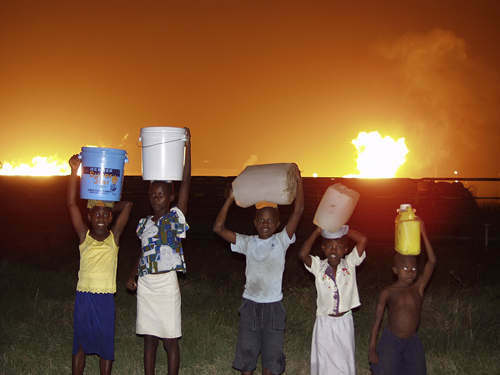 Nigeria is the world's eighth biggest oil exporter and sub-Saharan Africa's second-largest economy, but the gap between rich and poor is enormous, with most of its 140 million people subsisting on less than $2 a day. Literacy levels are low and access to basic healthcare limited in rural parts of the West African country. "Our major source of water supply here is the stream which you know people could defecate in and wash their clothes in," said Linus Nwankwo, a local teacher. "There is this belief here that there is nothing water could kill and that streams have a natural way of purifying themselves so I don't think people here boil their water before drinking."